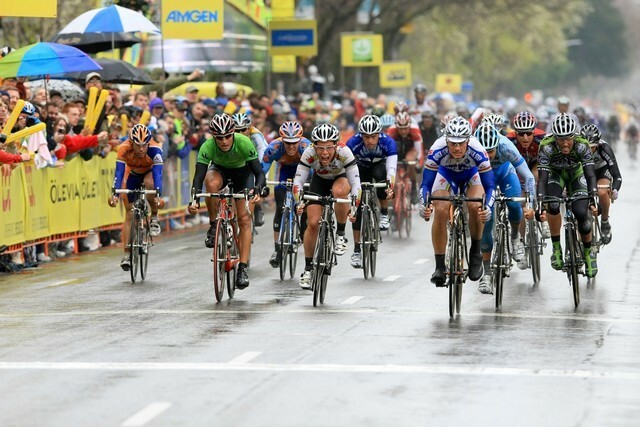 Tom Boonen (Quick Step) won the rain-soaked third stage of the Tour of California on Tuesday but he had to share the spotlight with Mario Cipollini (Rock Racing) after the ?old? Lion King finished an amazing third in the sprint. Germany?s Heinrich Haussler (Gerolsteiner) was second and Britain?s Mark Cavendish (High Road) was fourth. Cavendish was not feeling good during the stage and so agreed to lead out the sprint for team mate Gerald Ciolek who could have taken the race lead if he had won the sprint. However coming out of the final corner Ciolek slowed too much and lost Cavendish?s wheel. The young Brit found himself clear of the bunch. He thought Ciolek was behind him but when nobody came through he sat up and looked round. That was a fatal mistake. He lost speed and even though he accelerated again when he realised he was clear, Boonen and the bunch caught him just before the line. Tyler Farrar (Slipstream) finished sixth in the sprint. He scored three seconds in the intermediate sprints and so took the race leader?s yellow jersey. Cancellara is now second at one second, with Boonen third at four seconds. ?This one of my best sprint ever,? Boonen said. ?I did believe I?d win because Cavendish is not just one of bunch, he?s fast and the gap was immense but I had the speed in finale and I think the last 400 metres was one of my best sprints. I?m very pleased with it.? ?The sprint was pretty hectic but it?s always like that in weather like this and on circuits. I waited to see what happened and then got in front in the last km with Paolo (Bettini). The sprint was a bit of a mess. There was a gap and I saw Cav has 30 metres. Fortunately everything opened up and just caught him at the finish line.? 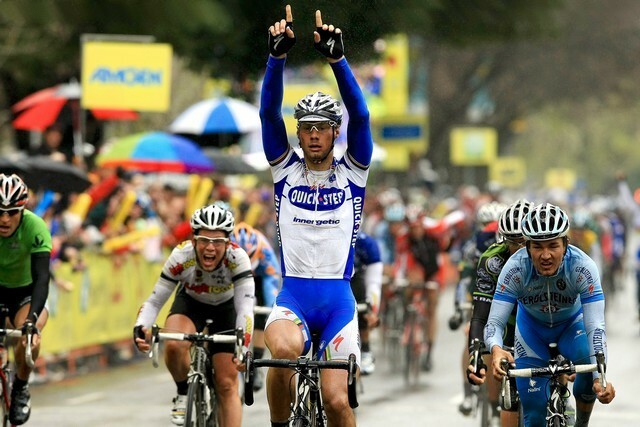 Boonen won the stage and Farrar took yellow but it was definitely Cipollini?s day. He got the biggest cheer from the crowd and proved that even at 40, after three years away, he still has the class to take on and almost beat the best in the world. Wednesday?s 165km third stage is from Modesto to San Jose in the heart of Silicon Valley and is the first real mountain stage of this year?s race. The peloton climbs to over 4000ft to the summit of Mount Hamilton and then faces the climb of Sierra Road before the dive down to the finish. Last year Levi Leipheimer forced the decisive break on the crowd-packed Sierra Road to set up overall victory. The stage is expected to be vital yet again this year. 10 Oscar Freire Gomez (Spa) Rabobank all same time.